Gleanntan Kennels, Reg. is a registered kennel name with the American Kennel Club (AKC). We are AKC Breeders of Merit and Michael is a Skye Terrier Club of America Approved Mentor. Michael also serves on the STCA Judges Education Committee. We welcome all inquires for mentorship in Skyes and are happy to host kennel visits or provide ringside mentoring for aspiring judges, upon request. From the Gaelic, ancient language of both Scotland and Ireland, comes the word meaning Dale - glean or gleanntan. 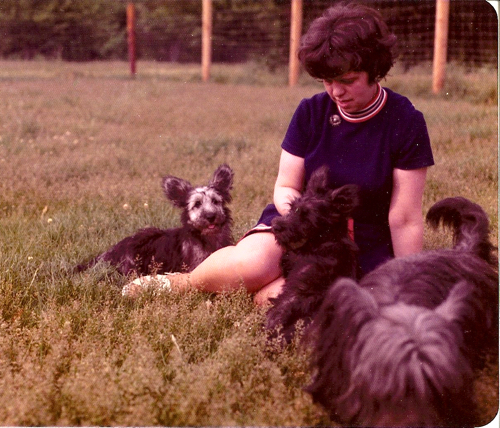 Gleanntan had its beginnings in June 1964 with the acquisition of a Kerry Blue Terrier by Ben and Donna Dale. He was joined later by a Beagle and Rhodesian Ridgeback which all starred in obedience activities. But the championship of one of their Kerries encouraged them to breed a Kerry litter and the die was cast. When their first Skye, Kelly (Ch. Jo Jac's Rise And Shine) arrived in 1967 they were totally taken in by the magic spun by a Skye Terrier. Kelly quickly finished her championship and was line-bred to Ch. Glamoor Gang Buster in 1970. 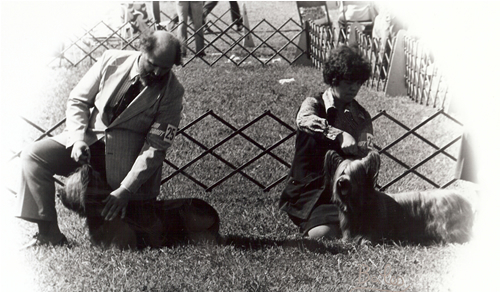 Nine puppies from this litter and a repeat breeding in 1971 finished their titles thereby earning Gleanntan the coveted "Winkie" award presented by Kennel Review Magazine for the Top Producing Dam - All Breeds (tie) in 1972. Ch. Jo Jac's Rise And Shine is one of the breed's Top Producing Dams with 16 champion offspring. Her son, Ch. Gleanntan Coming At Ya is the breed's Top Producing Sire. For the past forty-eight years, this small kennel has produced some of the breed's all-time greats with All-Breed Best in Show winners, Best in Specialty Show winners, and the breed's top producers. Gleanntan has been highly regarded for breeding Skyes with beautiful breed type - Skyes of substance able to carry out the work for which they were originally bred. In 2001, following the untimely passing of his wife, Donna, Ben Dale joined with longtime collaborators and close friends, Roxan Rohrich, Michael Pesare and Maida Connor. 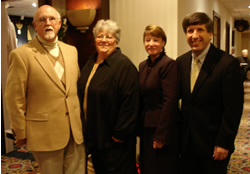 In April, 2010, Ben Dale joined his beloved Donna in heaven. Drawing inspiration from their mentors Gleanntan has been guided by Michael, Maida and Roxan. Gleanntan Kennels' will continue in its dedication to the Skye Terrier for many years to come. 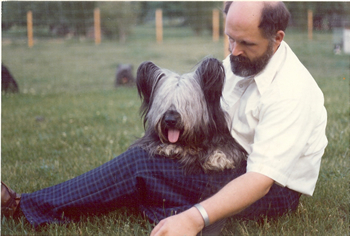 Our objective as breeders is to breed sound Skye Terriers in conformation and temperament. We strive to prove the quality of our Skyes in competition before breeding. Our joy in raising many fine Skye Terriers is magnified by the satisfaction we see in the same kind of success enjoyed by other breeders with the same objectives who have complimented our efforts by including Gleanntan Skyes in their breeding programs. We also take pride in the fact that many of the wonderful owners who we entrust with our Skyes, return to Gleanntan through the years for their Skyes. Our objective, always, in the past and in future years, is to protect the Skye Terrier as a breed. Unlike so many things in life, this activity is richly rewarded by the incredible companionship of the Skye... always faithful... ever true.